Every fall, we step outside, work together, and make our communities better during our global Serv-a-palooza event. This event provides tremendous relief to communities in need around the world. At our global headquarters in Stratham, NH employees were eager to pull on their boots and make a difference in the city of Manchester. Every fall, we step outside, work together, and make our communities better during out global Serv-a-palooza event. Employees from 19 different countries pulled on their boots to make a difference. Here in the US, volunteers tackled 6 different sites this year. From giving away 460 boots to elementary students, to repainting 51 houses, communities were impacted greatly. Timberland is determined to be a force for good and this annual event is one step closer. Volunteers were not afraid to get their boots dirty at Serv-a-palooza this year. They tackled projects like painting 51+ houses, building a patio for Veterans, gifting 460 students with new shoes and creating a brand-new teacher’s lounge. These projects and more took place in the city of Manchester, all of which impacted people in need. We served at the Manchester VA Medical Center, where we built a large patio, handicap accessible garden beds, and spread over 40 yards of mulch. In addition to this, we spent quality time with Veterans over yard games and lunch. Debra Krinskey from the Manchester VA Medical Center expressed her gratitude for Timberland, “the Veterans will be able to enjoy the new patio for their weekly BBQs and for their therapy as well. 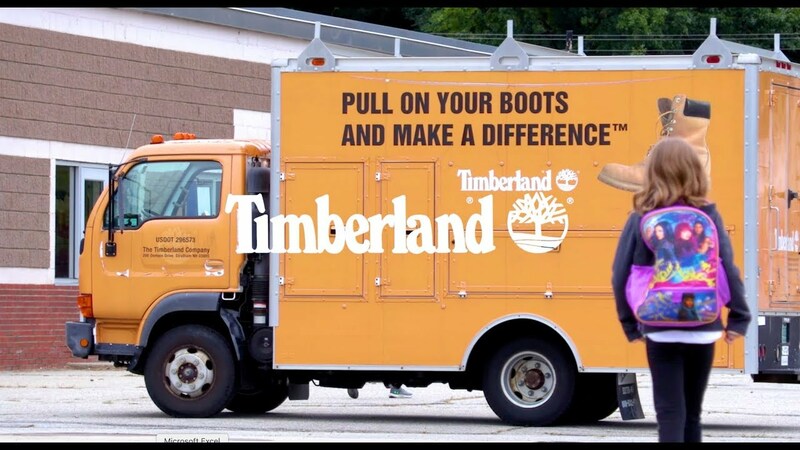 “Timberland is just in it whole-heartedly, to give back to veterans”, said Debra. At the Beech Street School, volunteers teamed up to give the deserving teachers a brand-new lounge. We spent time with these elementary students by reading stories to them and building picnic tables with them. Not only did we spend time with the students, but we worked together to help paint the halls of this school and bring color into the school. “They are making a climate change in our school, they are giving back to a community that really does deserve it,” a teacher from Beech Street School expressed about the volunteers. We went to Girls at Work to help prepare for the coming school year. At Girls at Work, girls in the Manchester community are empowered to learn woodworking skills after school and feel confident in what they have accomplished. We helped cut wood for the coming school year as well as created a mural in the woodworking shop. While Elaine was telling us how much we have impacted Girls at Work, a school bus drove by and the children started chanting, “Timberland! Timberland! Timberland!” At this moment, we all realized how much of an impact we had in this community. A little farther down the street we helped enhance the Rooting for Families Community Garden. We weeded, cleared the nature trail, as well as built a shed. This space gives families who have just moved to the city of Manchester the chance to participate in agriculture and work with other community members to keep this garden up and running. “One of the things that they have allowed people to do with the space here, is specifically for the new immigrant population in Manchester, to have a space and get a start on their life here, grow food, and create a welcoming environment,” a Timberland volunteer states.